The new year has arrived with a bang! There are 365 days ahead to grow something, which makes every day a gardening day! Giving yourself a good workout in the privacy of your own backyard is much nicer than going to a gym and you don’t have to force your ‘love handles’ into unbecoming lycra! While you are getting fitter and trimmer with pruning, weeding, composting, raking, digging, planting and mowing, your garden will reward your time and spent perspiration with lush growth and great harvests of flowers and edibles. Another advantage is that garden gym, which means spending time outside in the sunshine and fresh air, has a positive influence on your psychological health as well – it relieves stress and helps with depression. Regular hours spent in the garden will work out the muscles in your legs, back, stomach and will also give you a healthy cardiovascular buzz while the calories slowly melt away. Before starting your garden gym session, warm up those cold muscles by stretching a bit – it gives you time to decide what you are going to tackle first. 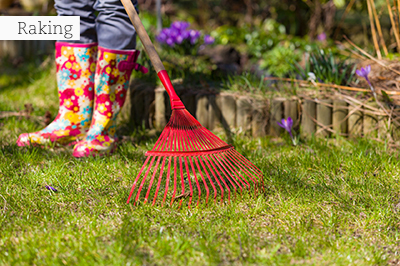 Vary your garden workout with different actions like pruning, raking, mowing, digging and weeding, and spend about 15 minutes on each activity to work out different muscles. Do some stretching and releasing exercises before moving on to the next action. If you stick to this regime regularly, everything which needs to be done in the garden will be done, and you will become trim and fit! Be on trend with one of the Pantone colour group for 2018 called “verdure”. Complementing shades in this group include “celery green”, “berry-infused purple” and “egg shell blue”. It is said that these colours are “symbolic of health”. Purple basil has spicy, scented, deep-purple oval leaves with clusters of pink flowers in summer. ‘Purple Ruffles’ has large, shiny, purple-black, ruffled and fringed leaves, with pink flowers. ‘Siam Queen’ has lush green leaves, square purple stems and deep-purple flowers. ‘Magical Michael’ is a compact, bushy plant with small purple and white flowers. Coreopsis ‘Citrine’: Bright, compact, showy and tough! ‘Citrine’ impress with great blooming beauty and a very neat growth habit throughout summer. The new flowers appear right on top of the old ones which just disappear. Coreopsis ‘Citrine’ works well en masse, as edging, or in mixed beds or containers. Low maintenance, easy to grow, and perfect for the sunniest places. Brachyscome Fresco Candy: Tons of bright magenta blooms cover these mounded plants all season long. ‘Fresco Candy’ is ideal for mixed containers. The plants are sensitive to over-watering, and for optimal performance, must be fed with a slow release fertiliser to ensure good flowering. Petunia ‘Babydoll’: Meet the little sister of Petunia ‘Night Sky’! Another unique colour pattern on a neat plant with great performance. ‘Night Sky’ and its sister variety ‘Babydoll’ may have the most distinctive blooms you’ve ever seen on this planet. 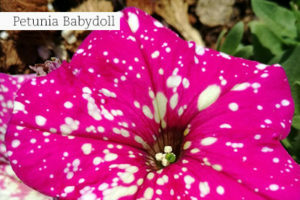 ‘Babydoll’ is primarily pink/rose but features eye-catching splashes of white/cream. ‘Night Sky’ is primarily purple with splashes of white/cream. Ideal for containers and hanging baskets, or as a unique centrepiece on your patio table. Deadhead spent and faded flowers to encourage new blooms. Zinnias can always be trusted on to supply bright colour in the hottest months of the year. They have leathery leaves and sturdy flowers which love the hot sun. Modern varieties are much more disease resistant than the old-fashioned ones grandma used to grow, and while tall growing, well-branched varieties are still popular. One can also fill the garden with dwarf types like ‘Profusion’, ‘Mondo’ and ‘Zahara’ – all three are suitable for container planting too. If we pledge our minds and hearts to using modern technology and good old common sense to save water, we will get the maximum value out of what we have committed to the soil with a clear conscience – not only in large gardens, but also in small spaces, and even in pots on a patio or balcony. 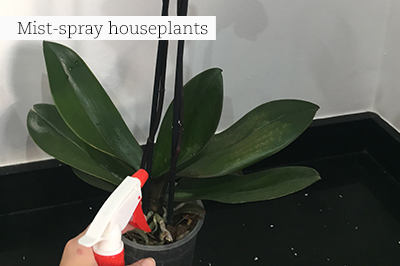 On hot days mist-spray houseplants like ferns and orchids to provide extra humidity. Keep ponds and bird baths topped up. Punch holes in the bottom of plastic milk, water, or soft drink bottles, place them on or in the soil around plants, and fill them with water from your hose or watering can as needed. Use a soaker hose rather than a sprinkler. Less water is required because the water is concentrated on the soil nearer the roots, and there is less evaporation. Mulch around all plants and veggies using a light 5-10cm mulch (dried leaves, straw, bark, coarse compost and other commercial mulches available at GCA nurseries), which allow water to penetrate the soil easily. Re-organise and declutter your space. We want low maintenance gardens, full of well-performing plants. So, ask at your favourite GCA garden centre for plants that can be relied on to grow effortlessly, and without too much water. Remove old flower stalks and dead material around the base of spent perennials to curb mildew, rust and red spider mite. 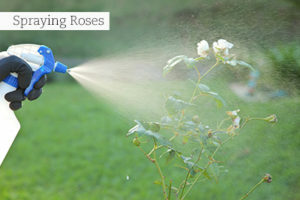 Spray roses against black spot, mildew and aphids. Watch out for hawk moth caterpillars feeding at night on impatiens, arum lilies and fuchsias – remove them by hand. Remedies for all the above pest and disease problems are available at your nearest GCA garden centre. Lawns will need slow releasing nitrogen to maintain their lush green colour. Garden containers, young seedlings, and indoor plants should be fed every two weeks with liquid fertiliser. Azaleas and camellias will need an acid fertiliser to help them set buds for winter. Keep them foliated by not cutting long stemmed blooms for the vase and spray regularly and preventatively against black spot, mildew and red spider mites to avoid leaf drop. Study your roses. If the leaves are a bleak light green colour, they need rose fertiliser. Bad performance can mean that the roots are too dry or robbed of food and water by another plant’s roots. Use water in a clever way. Roses need at least two or three deep watering a week. If you have restrictions, water them with grey water. 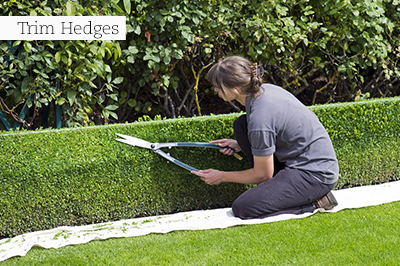 Don’t allow evergreen hedges and topiaries to grow out of shape. Keep them lightly trimmed and neat. Sow beans, beetroot, carrots, leeks, sweet corn, radish, spinach, and Cape gooseberries, and plant seedlings of tomatoes, chilies, basil, lettuce, celery, parsley, and brinjal. Feed fruit trees like mangoes, avocados, lemons and granadilla vines. Apply the specialised fertilisers for roots, foliage, and future fruit production – use slow releasing fertilisers at this time of the year. Remove fallen fruit to discourage pests breeding in them. Sow quick-maturing lobularias (alyssum), dwarf marigolds, portulacas and zinnias. Plant seedlings of Celosia, annual salvias, petunias, impatiens, vincas, begonias and marigolds. Problems with scale and aphids? Spray against these critters. Visit your local GCA garden centre for the best spray. Ensure there is no stagnant water in the cup-area of bromeliads – this will prevent mosquito larvae from hatching there. Nip out the growing tips of chrysanthemums and poinsettias to encourage bushy growth. Prune low branches of trees to allow in more sunlight. Tame overgrown shrubs, except those which will flower and produce berries in winter and spring. Thin out deciduous climbers like wisterias, Boston ivy (Parthenocissus tricuspidata) and ornamental vines (Vitus coignetiae). 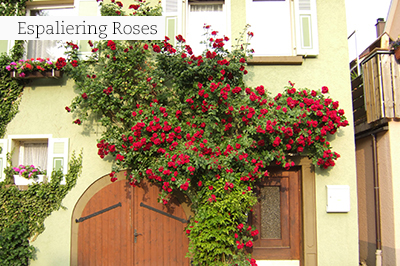 Espaliering or training the long branches of climbing roses will encourage flowering. Rotate indoor and shady patio plants, as well as hanging baskets, regularly towards the light to ensure even leaf growth. Pull out the old flowering stems of Inca lilies with a firm tug. Cut long lavender stalks, tie into bunches and hang upside down to dry. Place them in your linen cupboard. Cut spent flowers of liliums, leaving the leafy stems to produce enough food to the bulbs for next season. Keep well-watered and well-fed until they die down. Plant more chives, oregano, marjoram, thyme, sage, coriander and remember to plant your first crop of seed potatoes for an early winter harvest.